Early voting in our latest FenwayNation Poll shows that nearly three-quarters of readers (73%) think Blake Swihart is the post-season "bubble" player who most deserves consideration to be on the Red Sox playoff roster. As the chart shows, despite just hitting .228 this year, Swihart tops the list by a wide margin. Ranking second on the list is Brandon Phillips—who garners 12% of the vote. Next on the list (somewhat shockingly) is relief pitcher Heath Hembree (8%), who has been 'lit-up' in recent outings. 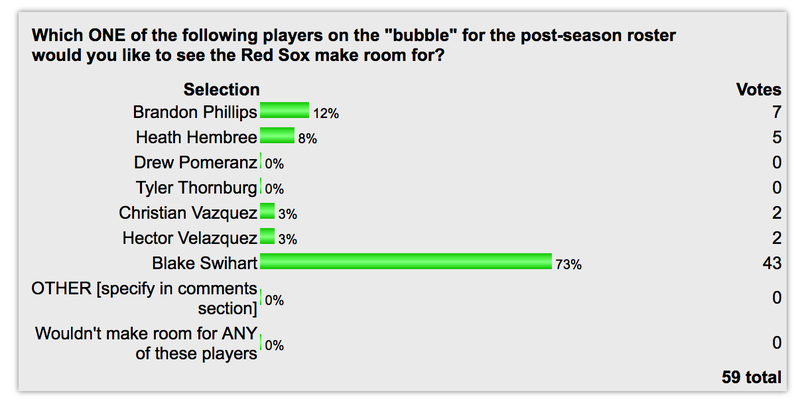 Following Hembree are catcher Christian Vazquez and pitcher Hector Velazquez—who each get 3% of the votes cast. No votes have yet been cast for players not appearing on our list—and no one yet supports the idea that none of these players should make the post-season roster. You can still vote in the poll HERE.